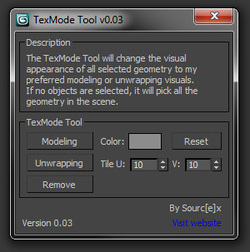 The TexMode Tool will change the visual appearance of all selected geometry to my preferred modeling (gray material, black wirecolor) or unwrapping (checker material) visuals. If no objects are selected, it will pick all the geometry in the scene. Installation: Download and run in 3ds Max. MAXScript → Run Script... → Find and run the downloaded script file. 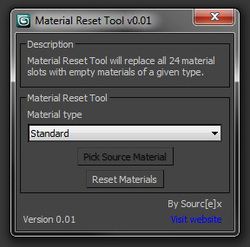 The Material Reset Tool will replace all the 24 material editor slots with empty materials of the given type.